In your free time how do you select where to put your energies, going on the premise that in a day there is so much time available, and so much energy to do the work you would like to do. Is there a principle you could follow to help you make wise choices in prioritizing where to put your attention? What are the consequences of the little decisions you make everyday? Do they add up to a happy, harmonious and healthy life, or to a discontented, stressed and frustrating existence? I have distinguished three primary areas which need attention in our free time in decreasing order of importance. These are the self, the family, and the home, and I will discuss what the consequences will be of placing priority on each of these things. Tend to your physical needs for nourishment, rest, exercise and hygiene before anything else. If you are hungry – eat. If you are tired – rest. These two needs must take precedence over all else. Exercise and physical hygiene should be tended to next, because these are activities that enhance health. Take care of the family’s needs for food, love, companionship, physical and emotional closeness, and help when it is needed. Notice that I have placed taking care of your personal needs before taking care of the needs of the family, because you must nurture yourself and come from a place of personal prosperity before you can give to others without being depleted. After you have taken care of yourself and your loved ones the next place you can give your attention to is the home. Spend your free time cleaning, and straightening up your house. How well you care for your home depends on your situation. If you have no children your task will be easier than if you do. If you are not working it is easier than if you are. If you have outside help it is easier than if you don’t. The size of the home plays a role, as well as if you are single or have a partner. Your physical health and stamina is another influence. All these factors must be taken into consideration when you set standards for your housework. If you have no children, do not work, and have a maid your standards can be high. If you have children, are working and have no maid your standards will have to be lower, because it will be physically impossible to nourish yourself and your family, which has to take precedence, and care for your home to a high standard all at the same time. If you have a limited amount of time the quality of one of these three things must be sacrificed, and it is up to you to make a choice as to which one it will be. Your vitality and energies will be expended in doing your housework. You will start to feel tired and run down. You will feel overwhelmed by the burden you are carrying. You will feel resentful of the work, because the price you paid in order to do it is taking care of yourself. You will start to feel angry at the people around you who aren’t helping. You will possibly be susceptible to catching colds from being depleted. Your level of happiness will possibly drop, because rather than taking care of yourself and having fun in your free time, you are expending your energies on trying to maintain order on the home front. If you select the self and the family as your priorities, the following will be the most likely scenario. Whenever you have a free moment you will take it to enjoy good food and get adequate rest. You will take time to nourish your talents and interests. If you like reading, you will read, if you are an artist you will play your instrument or draw. If you have to make a choice between soaking in a hot tub or doing the dishes you will choose to soak in the tub. If the choice is to do yoga or T’ai Chi Ch’uan exercises or straighten out the living room. You will choose to do the exercises. The net result of deciding to focus on yourself rather than on housework is that your housework will be neglected, and you will not have a picture perfect home. You will have to learn to tolerate disorder and turn a blind eye to the messes. This will be possible to do if you realize that if your house is in perfect order than you will be neglected. The Taoist sage Lao-tzu says you can either shine on the inside or shine on the outside, no one in the world can have excellence in both. You won’t feel overwhelmed and frustrated. You will have energy for creative endeavors. Your spirits will be higher. You won’t be susceptible to acute illnesses. Your attitude to life will be more easy going. You will be more tolerant of yourself and others. It is up to you to decide where you want to shine. Never do anything when it seems difficult to do or like it’s a burden. The feeling that it is difficult is a sign that you should stop and rest or do something else. Come back to the task later on or the next day when it seems like it will be easy to do. This is listening to the messages of your body and being in tune with them rather than fighting and opposing your own needs. If you just can’t face that pile of dishes in the sink after dinner, put it off, or get someone else to do them. It’s not a crime to leave the dishes over night. You can do them with ease the next morning when you are refreshed. And if you would rather watch the morning news or water the plants, its’s still okay that the dishes are in the sink. What is important is that you are focused internally rather than externally and that you are sensitive to what feels right, comfortable and keeps you happy. How do you know that you are doing something you should not be doing? You feel bored by it. You tire easily when you do it. You feel that you are wasting your time and your life. It makes you feel angry to do it. You can’t wait to get it over with. If your usual occupation makes you feel this way, you have probably chosen the wrong line of work. Or if certain tasks make you feel this way, then these are not conducive to you and move you away from your life’s purpose. It is not that there is anything inherently wrong with this work. It is just that it is not right for you at this time. If you feel like this when you are doing housework, then you just might not be cut out for the role of the perfect housekeeper. Maybe you should think about hiring outside help if you can afford it, getting as much help as you can from family members, or lowering your standards for your house, and increasing your tolerance for disorder. Your work should not tire you. You should find it interesting and challenging. You should prefer doing it above anything else. You should feel that the work is natural and inevitable to you. You should enjoy using the tools of your trade, and feel pleasure in your proficiency with them. You should never feel bored. If housework arouses these positive feelings in you, then it is an activity you may engage in and it will be health promoting for you. If, however, you do not feel this way when you do it, forcing yourself into the role will be illness promoting for you. It is good to know who you are and what you are good at, and to respect your strengths and forgive yourself your weaknesses. These strengths and weaknesses are guides. They help mold your destiny and guide you into occupations that suit your nature. Happiness lies in being true to yourself. Forcing yourself to keep a clean house if you hate housework just because you think society expects it of you is being false to yourself and can cause health problems. 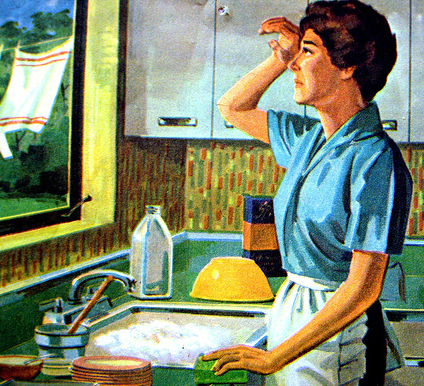 We have been conditioned as women in America to be good housekeepers. Let’s question these standards and weigh the sacrifices we have to make to maintain them. Our health is too high a price. About the author: Deborah is a certified classical homeopath in private practice in Menlo Park. She believes that to be healthy all aspects of one’s life must come into harmony starting with having healthy thoughts and emotions to cultivating healthy relationships and a healthy life-style. She assists people with remedies and some guidance to bring joy, happiness and health back into their lives.